With the assistance of our team of professionals, we are offering our clients a broad array of Panel Blinds. Perfect for rooms requiring both small and large window treatments. Beautiful and stylish. Panel track system feature sliding woven wood or fabric panels that glide effortlessly along an aluminum track to easily cover sliding, patio doors and other large window. We are offering Panel Blinds to our client. We are offering Panel Roller Blinds to our client. 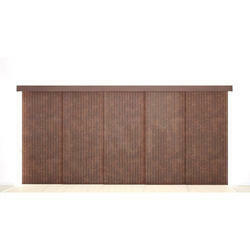 As per the needs and requirements of our clients, we are involved in providing Panel Track Blind. Our organization is highly trusted in offering Panel Blind to our clients. We are offering our range in different selection of fabrics to meet requirements of clients. We are remarkable enterprise, instrument in offering superior quality Panel Blind.